We play and sing traditional Hawaiian music. Our purpose is to spread aloha while maintaining strict adherence to the traditional style of the Hawaiian beat (as played for hula) and pronunciation. We are the Kapalakiko Hawaiian Band. The meaning of Kapalakiko is “San Francisco”. 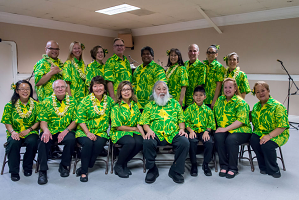 Over the years, our bandleader Saichi Kawahara has taught over two thousand students in the Bay Area how to play the ukulele and sing Hawaiian songs—in “the traditional way.” The Kapalakiko Hawaiian Band, which now consists of his most advanced students, plays at gigs throughout the Bay Area.